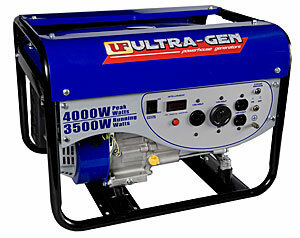 Ultra-Fab's 3500 watt manual start generator is perfect for toy haulers, travel trailers and fifth wheel trailers. With this powerful model you can run your refrigerator, microwave, air conditioner and lights all at the same time. Comes standard with a 30 Amp RV plug, 6.5 hp 4-stroke engine and full 1 year warranty. The power you need for your air conditioner, power tools, and small appliances. Integrated control panel includes a 30A 124V twist-lock outlet, 30A 120V RV receptacle, 20A 120V outlet, and a voltmeter. Can run 10 hours at 50% load. The 6.5 HP OHV, four stroke, single cylinder engine is air cooled and has a recoil start. Features include low oil shut off for longer life, 4.0 gallon fuel tank, rugged 1" tubular frame for protection and durability, 68dB noise level from 23' and weighs 100 pounds. One year warranty. Affordable portable power for your air conditioner, power tools, and small appliances. Integrated control panel includes a 30A/120V twist-lock outlet, 30A 120V RV receptacle, 20A 120V outlet, voltmeter and an hour meter. Runs up to 10 hours at 50% load. The 6.5 HP OHV, 4 stroke, single cylinder engine is air cooled and has an electric and recoil start. Features include low oil shut off for longer life, 4.0 gallon fuel tank, rugged 1" tubular frame for protection and durability, 68dB noise level from 23' and weighs 100 pounds. 8" solid wheels and fold-away handle bar for easy positioning around your campsite. One year warranty. Not available in CA. Ultra-Fabs 3500 watt manual start generator is perfect for toy haulers, travel trailers and fifth wheel trailers.